Surfers taking advantage of the big waves after a rain storm. Beach club in Marina di Pietrasanta before sunrise. A sidewalk made of marble. View of the sun rising from the Forte dei Marmi pier. 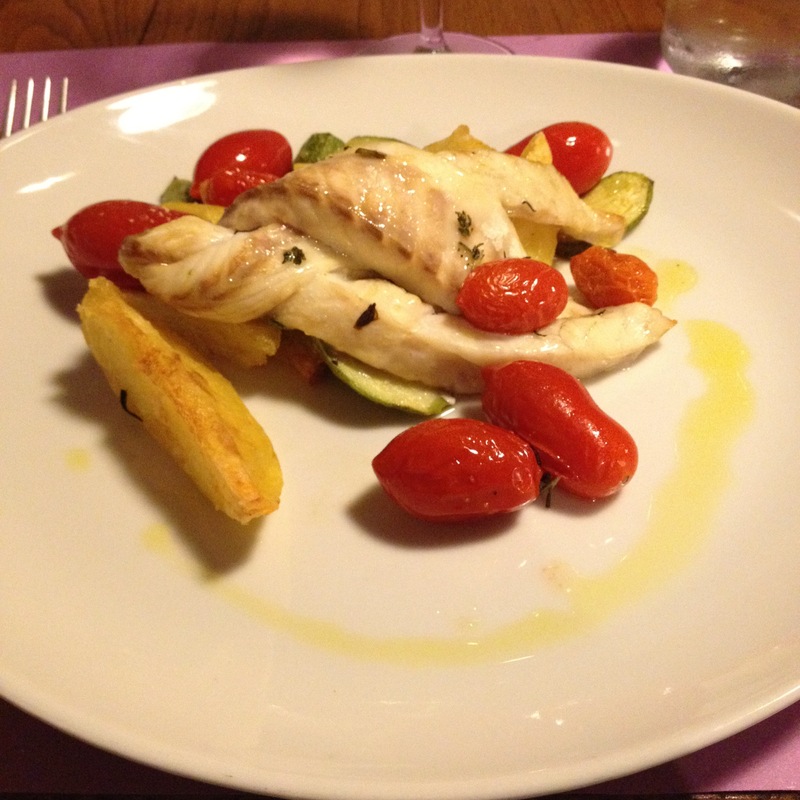 Delicious branzino at Pinocchio a Pietrasanta. The pretty piazza in Pietrasanta. I haven’t spent that much time in Tuscany. I’ve been to Florence, Siena, and the tiny town of Terriciola which isn’t too far from Pisa. I was going to stay in Rome for my birthday. However, the horrendous heat, the fact that 99 percent of my friends were gone for Ferragosto, and dealing with screaming drunk American college students and loud high school Italian teenagers on my street pushed me over the edge. I booked a trip out of town. My friend Michelle, who lives in Milan, told me about Versilia. Her husband happened to be in the area that weekend. He was dropping off their young son who was going to stay at his great aunt’s house. He showed me around Versilia. I don’t know if it was escaping from the heat or what but I fell in love with this part of the Tuscan coast. 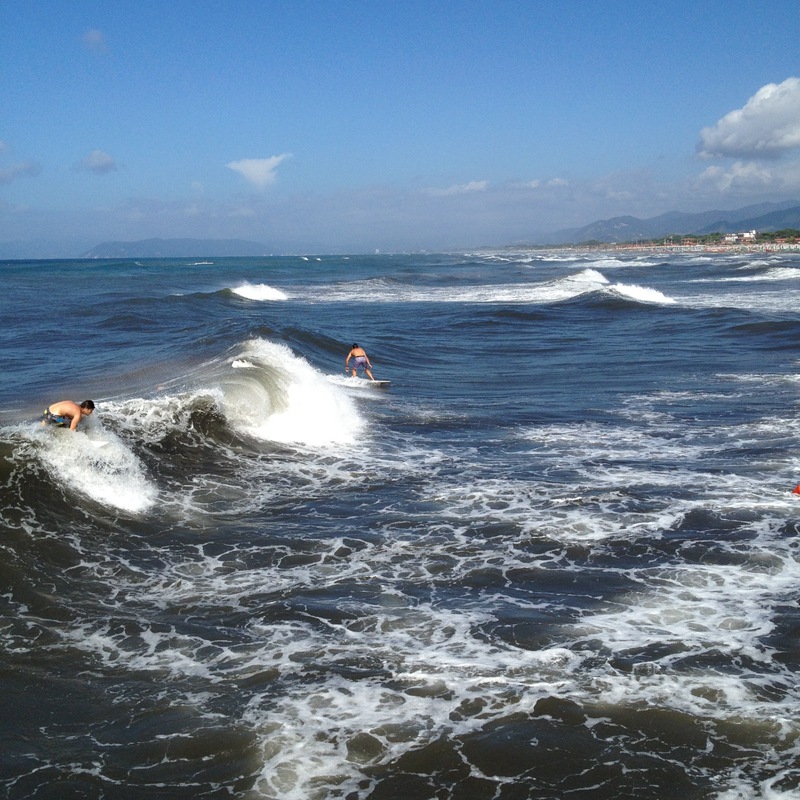 Sometimes referred to as the Tuscan Riviera, Versilia is in the Northwest part of Tuscany. 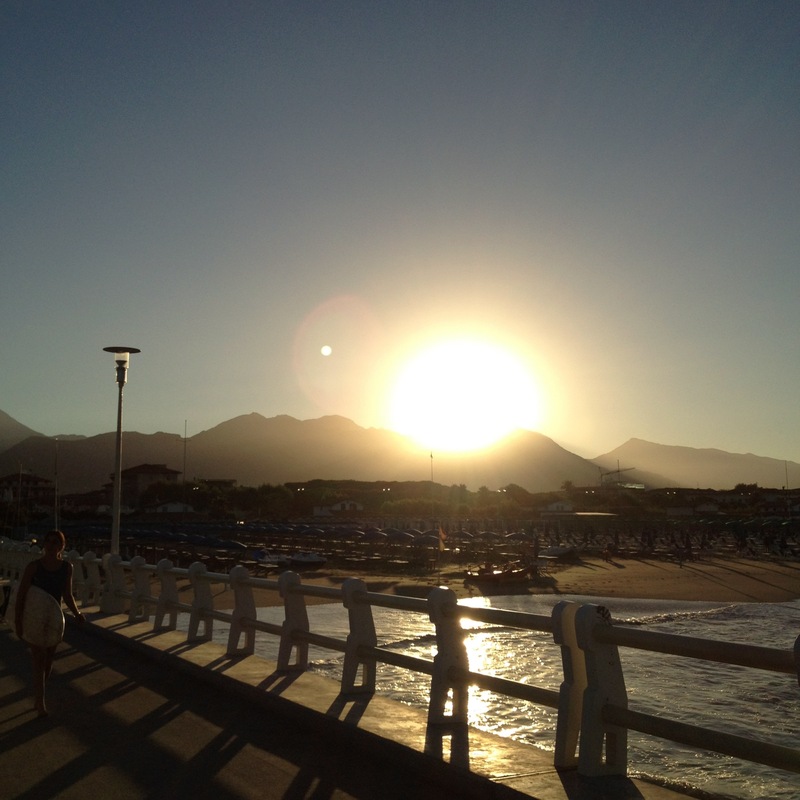 I stayed in the town of Marina di Piestrasanta. 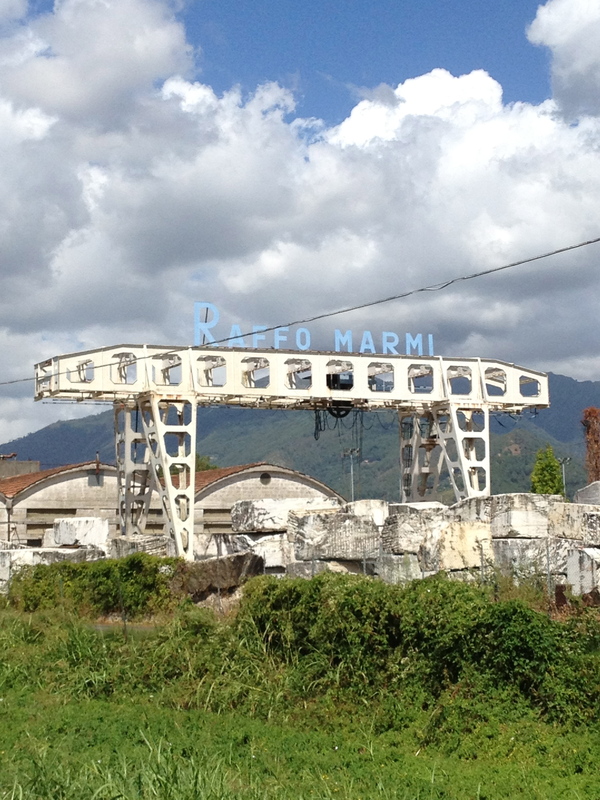 I had no idea I was so close to the Forte dei Marmi border. The two towns share a great park filled with pines trees. The smell was glorious. Marina di Piestrasanta was a little more laid back. 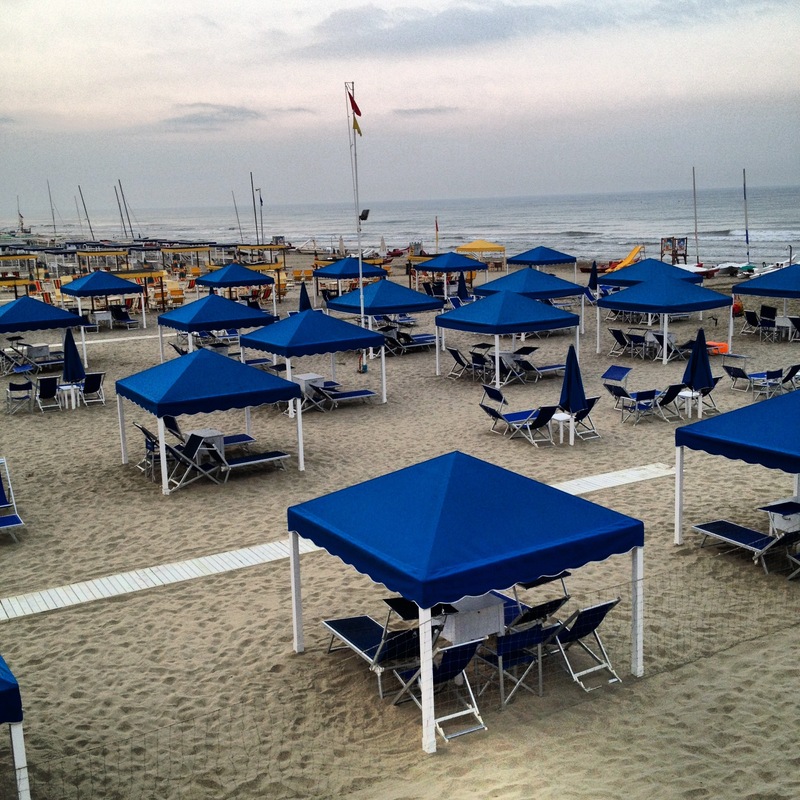 Forte dei Marmi reminded me of the Hamptons/Martha’s Vineyard. There were all these super chic people on their bicycles whose families have been going to the area for decades. Then you’d turn a corner and see a Veline/showgirl with massive fake breasts, injected duck lips, and a much older man on her arm. As with the Hamptons and Martha’s Vineyard, the new money is pushing up the price of real estate sky high. Many locals worry about losing stores like a butcher shop or pasty shop to another high-end clothing store. FDM has become very popular with wealthy Russians. Most of the real estate offices had signs in Italian and Russian. I know this is going to sound nuts, but it was so weird not to see any Americans or hear English. Yes, I live in Italy, but Rome has a lot of tourists and American expats. All the tourists in my hotel were Italian or German. There wasn’t a single flip-flop girl sighting the whole weekend. I wonder why that is. Above Marina di Piestrasanta is the hill town of Pietrasanta. This small town was packed with art. 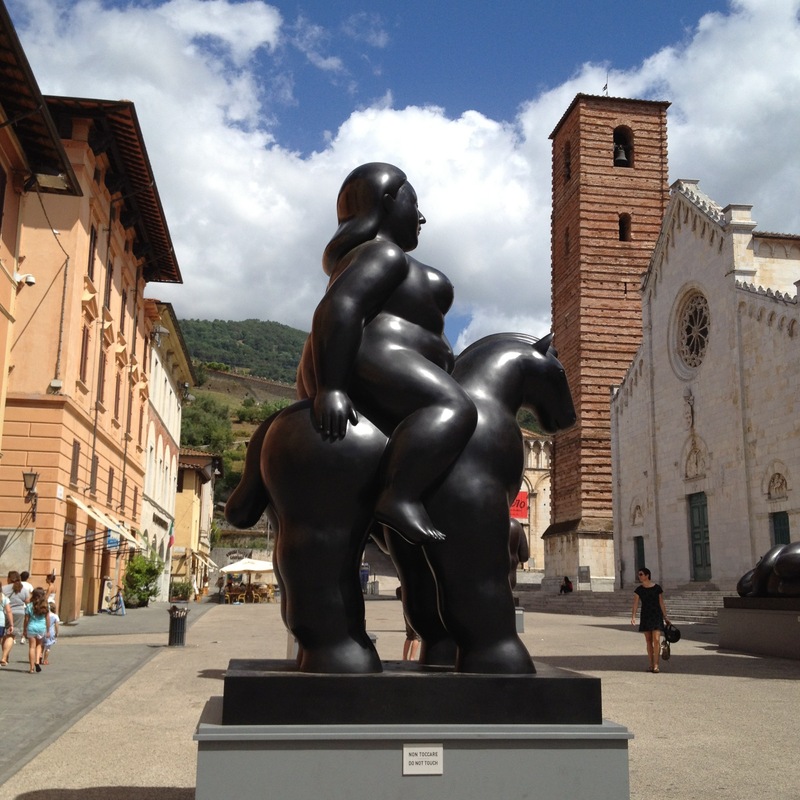 The famous artist Botero has been going to Pietrasanta for thirty years and has a home in town. 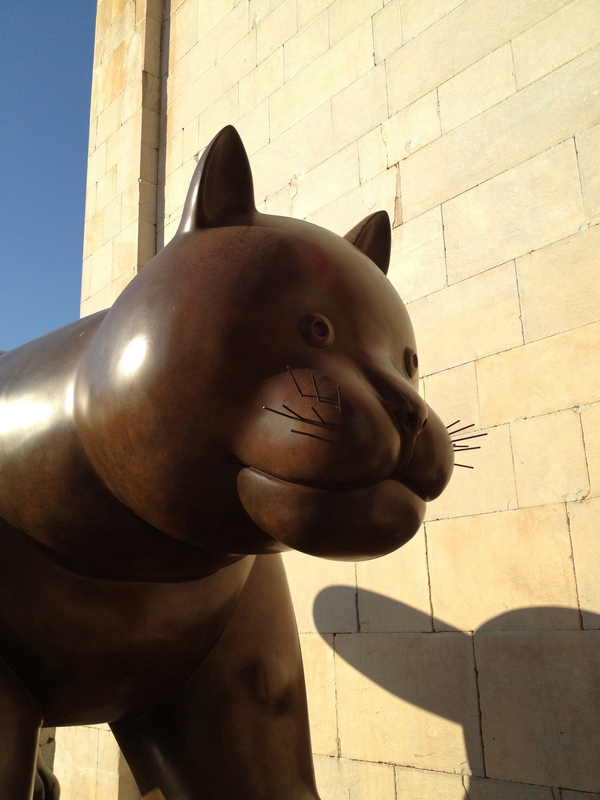 To celebrate his 80th birthday, there was a large (and free) exhibition of his work. 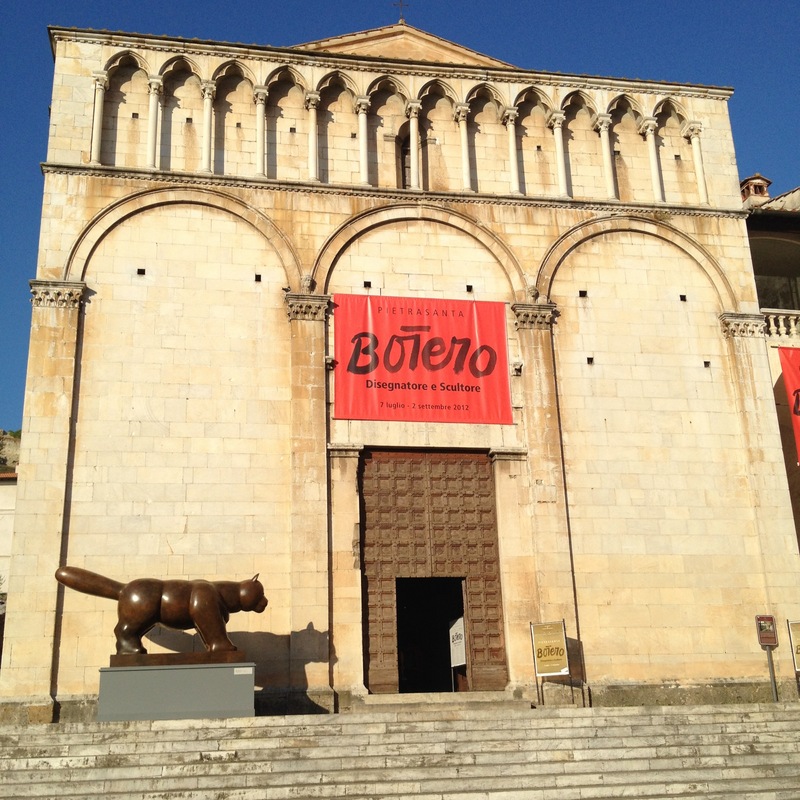 Versilia has been popular with artists for centuries. 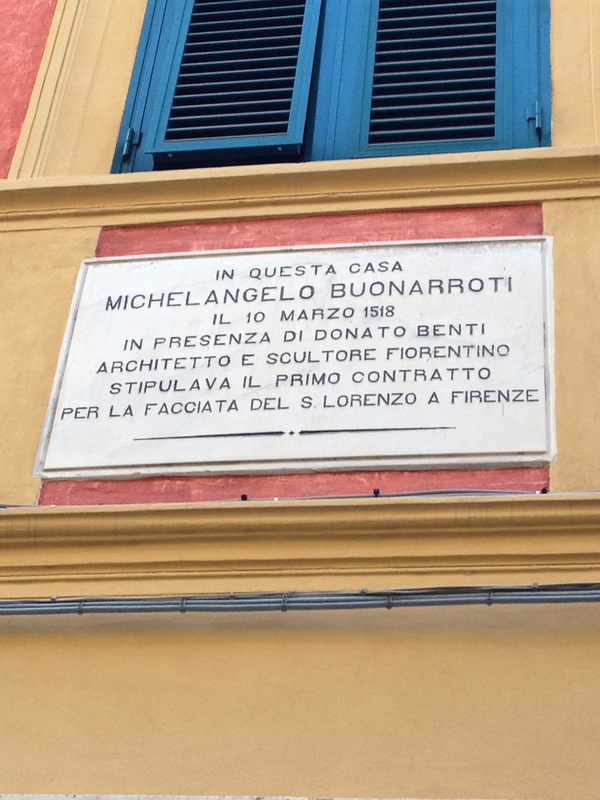 Michelangelo stayed in Pietrasanta. What looks like snow on the Apuan Alps is actually marble. On my next trip I would like to visit one of the marble quarries. 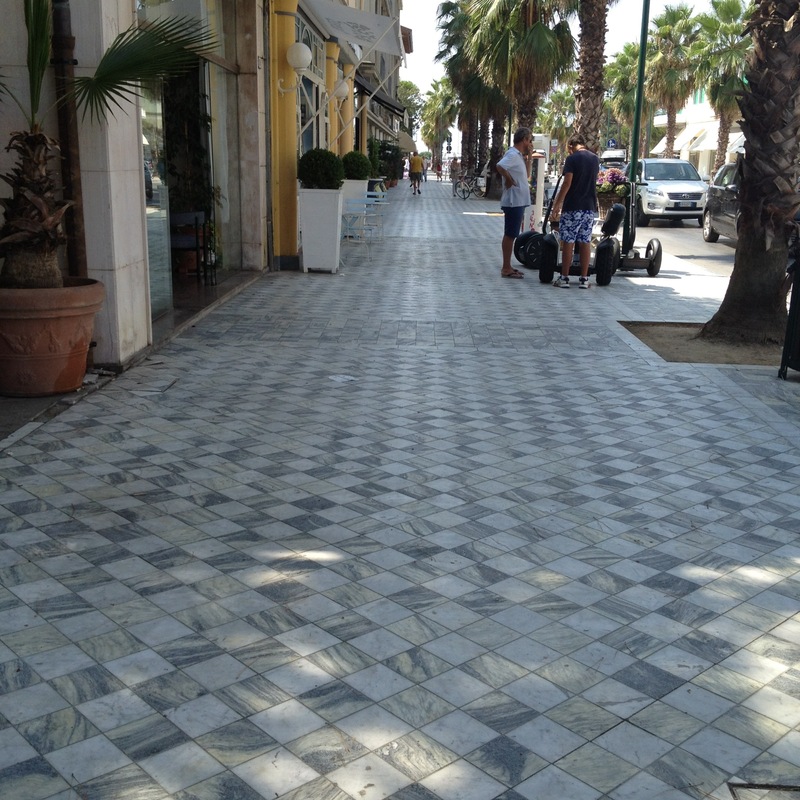 Speaking of marble, some of the SIDEWALKS in Forte dei Marmi were made from the expensive material. I’m definitely spoiled by Caribbean beaches. It’s strange that I would love to have a place in the area but I probably wouldn’t join a beach club. I loved the beach town vibe but didn’t love the beaches. People were very friendly and the food was delicious. 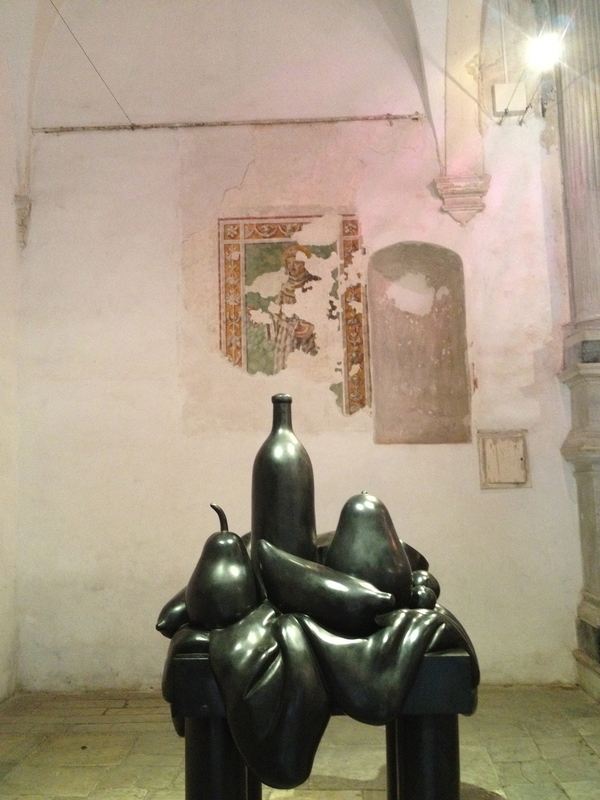 I drank a lot of Franciacorta. Overall, I had a great birthday weekend. I had one moment of, “everyone is here is with someone or their family, and I’m alone” but it passed pretty quickly. I think it helped to be surrounded by so much beauty, delicious food, and the sea. The night of my birthday I went to the Principe Hotel roof bar for a glass of Franciacorta after dinner. The views were stupendous. I believe the views were the reason my glass of wine was double the price of what I paid at dinner even though it was from the same vineyard. That’s okay, as the kids would say YOLO, you only live once. Gorgeous. Glad to see and read more about your trip. You were so right to TYS!!! Love you. Ah I forgot, PS. Maybe no flip-flop sightings because it isn’t in Rick Steves? It sounds pretty off the beaten path. Is it hard to get to with public transport? I think a lot of the college kids hit the same venues, esp. Cinque Terre, Amalfi Coast. It’s pretty easy to get to by train and is only an hour or so south of Cinque Terre. I don’t think it’s been written up in Rick Steves. While there is a club scene at night by the beaches, I get the sense that’s it’s very expensive. The flip-flops girls like to do shots. In general, I think for Americans who have been to Italy before and know some Italian it’s a great place to visit. For others it might not be “touristy” enough. Gorgeous photos and gorgeous place!! !